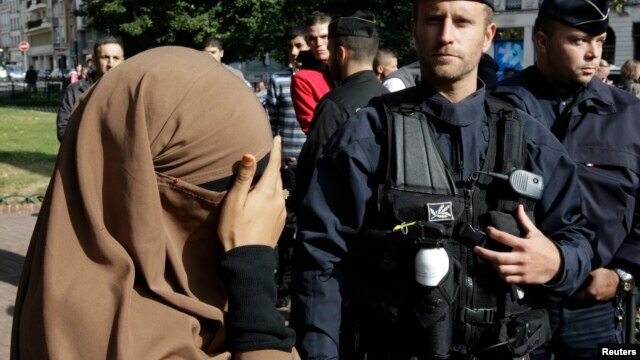 A woman wearing a full-face veil, or niqab, covers her eyes as she stands near police in Lille, France, in this September 22, 2012, file photo. PARIS — As temperatures soar in France, tensions are also on the rise over Islam, immigration, violence and the state's response to long-simmering tensions in the country's low-income suburbs. It all started with weekend clashes outside the French capital. Just as French government ministers begin packing their holiday suitcases, violence erupting in the Paris suburb of Trappes suggests they may not be in for a calm summer. Dozens of people assaulted the Trappes police station this past weekend, throwing fireworks and setting trash cans on fire. 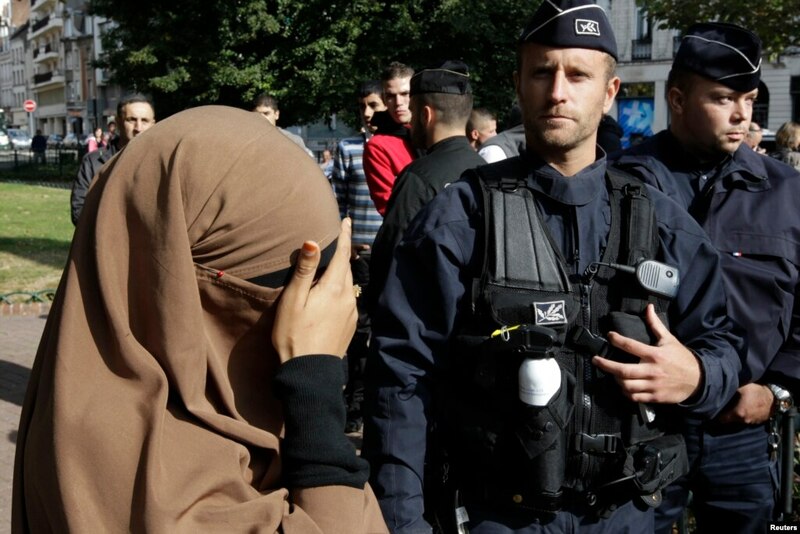 The incidents apparently took place after police arrested a man for assaulting them, after they detained his wife for wearing the face-covering veil in public - a practice that is banned in France. The chain of events sparks memories of previous unrest - first in 2005, when youth riots swept across the country, mostly in immigrant-heavy neighborhoods. In 2010, a new French law banning the face veil also triggered debate and anger. What's different today, says French sociologist Michel Wieviorka, is the connection between the two issues. Wieviorka is the author of "Evil," a book exploring terrorism, violence and racism. "There is something which is really new. It is the fact that suddenly two issues that in the recent past were distinct became one and only issue. That is to say, on the one hand, you have many people living in these kinds of poor suburbs that are facing social inequalities, exclusions, racism, police behavior - the classical issue force that explains social riots in the French suburbs, banlieues," said Wieviorka. The other issue, said Wieviorka, is the ongoing tension over the French face veil ban. Several hundred women have been caught violating the ban since it became law, although not all have faced penalties. In this latest incident, police say the husband of a woman flouting the ban tried to strangle one of their officers. Local Muslim groups dispute that account. On Monday, a teenager was sentenced to six months in prison in connection with the Trappes clashes. Two other defendants were acquitted. The situation in Trappes remains tense but, for the moment, calm. France's Interior Minister Manuel Valls has defended the police response. Interviewed on French radio following the violence, Valls said Trappes residents want order and calm restored - and that's what's happening. He saluted what he called exemplary work by the police. Valls also defended the French face veil ban, saying it was not against Islam, but rather was in the interest of women. But the response by France's leftist government has sparked strong criticism - both for being too tough and not tough enough. Politicians from the main, center-right UMP opposition party accuse the government of being too lax. Interviewed on France-Info radio Tuesday, former UMP minister Valerie Pecresse criticized the justice system for not cracking down more swiftly and firmly. What's clear, said sociologist Wieviorka, is that successive governments - both from the left and the right - have failed to alleviate longstanding tensions over immigration and violence. "In front of all these problems at that stage, the only possible answer for the government has been sending in the police, sticking [to] terms of order, in terms of security, respect of the law," Wieviorka stated. For example, Socialist President Francois Hollande made campaign promises to end racially based identity checks and to introduce legislation giving immigrants the right to vote in local elections. So far, Wieviorka says, neither promise has been fulfilled. "So there is a strong feeling that if you live in these neighborhoods, if you are an immigrant, you are Muslim, or you are different, you are not taken seriously into account," said Wieviorka. New reports Tuesday suggest French police are now being probed over racist remarks made on an unofficial police Facebook page at the time of the Trappes violence. France's summer is just beginning. It remains to be seen just how it will end.